Making ridgelines for hammocks is pretty easy: all you need to do is tie a line from end to end on the hammock. However, making the ridgeline adjustable allows you to modify the sag of your hammock incrementally to suit your taste. 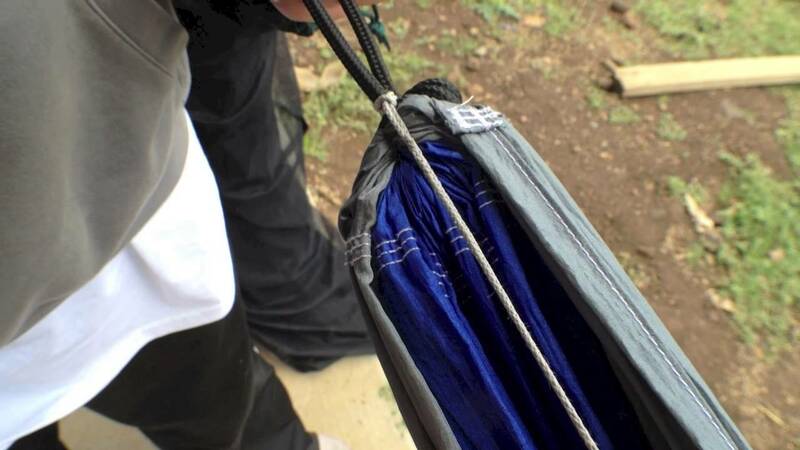 I have used long Whoopie Sling-style ridgelines, which work fine. This method shows how to use a LoopAlien to make the adjustment. The benefit is that you can easily add this to or take it off a hammock, adjust it, and not worry about splicing. The LoopAlien doesn’t have any sharp edges either, so there is no worry about ripping a hole through an added bug net or on your hammock. Derek, I like the adjustability and the ease of removal (as opposed to the semi-permanent adjustable whoopie sling ridgeline I use currently). My only question is: can this work with a “structural” ridgeline? I use a structural ridgeline for dialed in “sag”… can the loop alien handle this increased tension, or is it only intended as a bugnet/accessory ridgeline? Thanks! I added a ridgeline to my DoubleNest easily. I used some 5/32 Amsteel and just fixed each end to the ENO carabiners. Once set for my preference it stays in place and just stuffs in the bag along with the hammock. You are absolutely right about protecting gear. That’s what I thought I mentioned in the post, but I may be wrong. Love the site! It’s been very useful, I truly appreciate all the help you provide.. If I’m trying to set up an adjustable hammock ridgeline w/o any hardware. Would you recommend following (relatively) the same procedure that you suggest in hanging a continuous ridgeline for a tarp over the hammock, i.e., secure fixed end with either double hitch, figure 8 with clove hitch, etc., and then taut-line hitch on the other side for adjustment, or is there a better method for this? Please let me know at your earliest convenience. Yes, that would work but I don’t think the taut-line hitch will hold the stress. Instead, use a truckers hitch. If you don’t think you’ll need the extra power provided by the trucker’s hitch, or don’t have enough line to make that work, you could also use tie a directional figure eight loop (or an alpine butterfly loop alternatively) in the ridgeline about 12-18 inches from the end of the suspension, then pass the free end around one the hammock suspension (as shown in the loopalien video above) and then connect the free end to the inline loop with the becket hitch. If you’re not familiar with that hitch, Derek just posted a how to video about it recently and touted its adjustability. Would this set up be enough for the hammock sag, bugnet, and a tarp? I’m not sure I follow you. I don’t recommend using a loop alien with hammock suspension. Sorry, not as a hammock suspension. So attached to the hammock (already suspended using whoopies or what-not), would this set up of LoopAlien and LashIt be strong enough to maintain desired sage, have a tarp on it, and have a bug net on it? Are tarps ever even set up just to lay on top of ridge lines? Yes and yes. Most folks hang a tarp separate from the hammock but you can connect a tarp directly to the hammock. Check out my post on a tarp and Hennessy hammock.